(c) the buy-back is twenty-five per cent. or less of the aggregate of paid-up capital and free reserves of the company and such buy-back has been authorised by a Special Resolution passed at a general meeting of the company. Step 1: Convene a Board Meeting after giving notice to all the directors under section 173 of the Companies Act 2013 to pass the necessary resolution and approve the notice of general meeting of the company and letter of offer for buy-back. Note: The Explanatory statement under section 102 as annexed to the notice calling general meeting shall disclose the particulars as specified in section 68 (3) Read with Rule 17 (1). Step 2: File Form MGT-14 within 30 days of passing board resolution. Step 3: Convene a General Meeting and pass the necessary special resolution and file Form MGT-14 to the Registrar within 30 days of passing the resolution. Step 4: File letter of offer in Form No. SH.8 with Registrar of Companies which must be dated and signed by at least 2 directors one of whom shall be the Managing Director, if any. Step 5: File a Declaration of solvency in Form No. SH.9 with the Registrar of Companies and SEBI, if listed, along with the letter of offer and verified by affidavit to the effect as prescribed in sub-section 6 of Section 68. Note: Declaration of solvency shall be signed by at least 2 directors one of whom shall be the Managing Director, if any. Step 6: Dispatch the Letter of offer to the shareholders/security holders within 21 days from its filing with the Registrar of Companies ensuring the matters as prescribed in the Sub-rule 10 of Rule 17 of The Companies (Share Capital and Debentures) Rules, 2014. 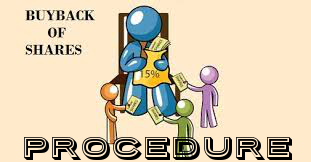 Step 7: The offer for buy back shall remain open for a minimum period of 15 days but not more than 30 days from the date of dispatch of letter of offer. Step 8: In case the number of shares or other specified securities offered by the shareholders or security holders is more than the total number of shares or securities to be bought back by the company, the acceptance per shareholder shall be on proportionate basis out of the total shares offered for being bought back. Step 9: Complete the verifications of the offers received within 15 days from the date of closure of offer. i. Make payment of consideration in cash to those shareholders/ securities whose securities have been accepted. ii.Return the share certificates to those shareholders/security holders whose shares/securities are not accepted at all or the balance of securities in case of part acceptance. Step12: Extinguish and physically destroy the shares/ other specified securities bought back within 7 days of the last date of completion of buy back. Step 13: File the Return of Buy back with the Registrar and SEBI, if listed, in Form No SH.11 on completion of buy back along with the certificate in Form No SH.15 signed by two Directors one of whom shall be Managing Director, if any, certifying that the buy-back of securities has been made in compliance with the provisions of the Act and rules within 30 days of such completion. Step 14: Maintain a register of bought- back Shares /other securities in Form No SH-10 at the registered office of the Company and keep in the custody of company secretary or any other person authorized by the Board in this behalf and the entries shall be authenticated by company secretary or any other person authorized by the Board.